Circle 226 on Reader Service Card bruised by the fear and fallout following 9/11. as well as a number of high-profile "sick ship" cases. Fort Lauderdale accounted for 49 per- cent of the total cruise passenger traffic. Overall. 72 percent of the total passen- gers recorded for 2003 chose Caribbean and Bahamas destinations. The figures are part of a statistical series issued quarterly by MarAd on U.S. cruise pas- senger traffic, with data for the 10 major cruise lines operating cruise ships with a capacity greater than 750 passengers. With the completion of 2003, MarAd now has available a three-year time series of data on North American cruise passenger traffic. Along with the cruise line and vessel name, the record for each cruise in the database contains the num- ber of passengers carried, sailing date and departure port, destination, cruise length and ship capacity. To deliver the most reliable thruster systems. 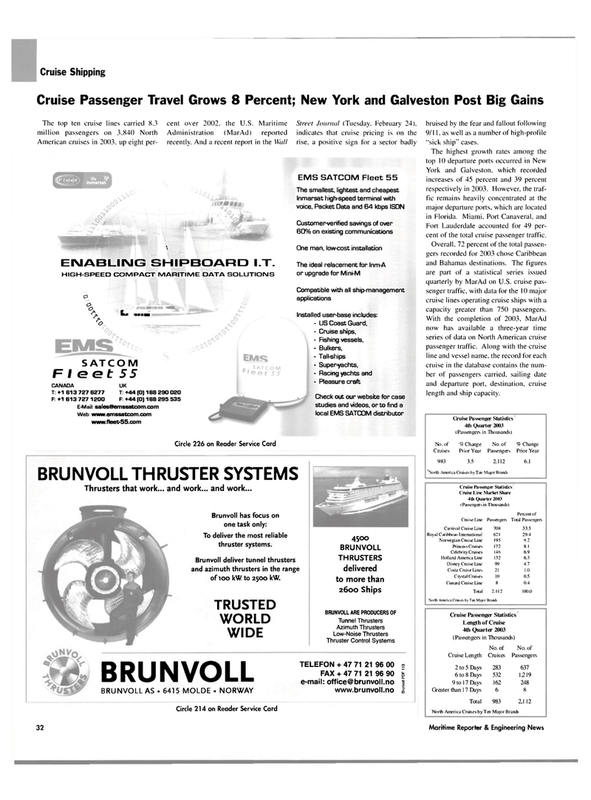 Brunvoll deliver tunnel thrusters and azimuth thrusters in the range of 100 kW to 2500 kW.